I'll give you a few hints. It was started early this spring from seeds obtained from a swap. Hmmm . . . can't remember for sure if it was Monica's mail swap, or MBT's garden show swap. I've never seen a variegated form of this plant, and the blooms are normally completely different. Started from seed, it may take up to 3-5 years before it blooms. It would be unusual for this species to bloom the first season. Remember, this seed was started this spring. Here are more hints: This is a native plant, and the blue-blooming variety was recently (I won't give away which year,) chosen as Perennial Plant of the Year. Here's more of the plant in question. Initially this seedling had plain foliage just like the others started at the same time from the same seed packet. A few weeks ago a few top leaves suddenly developed the white edges, flower buds formed, and within a few days, the tiny blooms opened. Did you guess what it is? Have you ever tried starting them from seeds? If so have you ever seen variegation and blooms like this before on your seedlings? I wonder what will happen to this plant if I decide to put it in the garden. Will it continue to develop variegated foliage? Will it survive the winter? Will it have these uncharacteristic blooms again next year? Is it a stray seed of some other plant that has the same kind of foliage as what I think it is that snuck into the seed packet, and not really what I think it is? Do I have some kind of unusual sport or hybrid? Perhaps only time will tell. Yay - the first cucumber! Last year cucumbers were started in the basement around May 1st, and they produced like crazy beginning in early July. We had such a bumper crop I ended up making several jars of bread and butter pickles with the extras we didn't consume or give away. We've been enjoying the delicious (if I do say so myself) pickles since, and the last jar is almost empty. This year I started cukes from seed in the west veggie bed in mid-May. Unfortunately cutworms destroyed all the seedlings within days of their emergence. So about a week later I started more seeds in the basement, and let the plants grow there until they started vining. They started producing male blooms weeks ago, and finally, finally the female blooms are coming. It will be a late harvest, but I'm thrilled finding the first ripe cucumber of the season this morning. Needless to say, I'll be keeping the cucumber seedlings in the basement in the future until they're sturdy enough to foil the cutworms. It's been a great year for tomatoes. Every couple of days I gather the ripe ones. The photo is representative of what I harvest several times a week. We really don't need thirteen tomato plants, but I've been enjoying experimenting with several heirlooms I've never grown, along with the usual staples I've loved for years. We've been enjoying them all for weeks. The yellow pears came from a volunteer plant that I left in the east veggie bed. They're not my favorite cherry-type tomato, but they're not bad and they're kind of cute. Except for a few tomatoes that have fallen to the ground and gotten yucky, not a single one has gone to waste. Several batches of salsa have been made, some have been eaten out-of-hand, especially the cherries, others have made wonderful pasta sauces, and many have been shared with friends and clients. For sauce, after cooking the tomatoes and running them through a sieve, I add a small can of tomato paste to thicken them up instead of boiling them down forever. Adding the paste minimizes cooking time and heating up the house during what has already been a hot enough summer. There are beets out there ready to harvest, and I even picked a few beans I missed yesterday. The peppers picked yesterday ended up in a delicious Thai curry dinner, made with leftover jerk chicken, organic coconut milk, peanut butter, garlic, onions, herbs, spices, and peas, and served with organic brown Basmati rice. Guess what's for lunch today! Speaking of bumper crops, we've had a bumper crop of dragonflies this year. I've had several up-close and personal encounters with them, having them land on me and land nearby. A couple of weeks ago one landed on a daylily in a client's garden, and seemed to be checking me out quite intensely, for a really long time. As I moved around the garden, he followed, and was my companion for at least 20 minutes. I've wished the camera was with me to capture images of the dragonflies encountered this season. This one was resting here for a nice long time, and was accommodating enough to wait for me to grab the camera. I believe it's a female Green Darner. Helenium autumnale, commonly known as sneezeweed, joins cardinal flower in the swale at the back of our property. Both are blooming and thriving in the section that never dries out. It should be a perfect spot for them, since they like moist to wet soil. Started from seed from Monica's seed swap just this spring, it's a thrill seeing helenium bloom its first season, especially since it's planted in a pretty shady spot in our swale. This is the first time having helenium in our garden. Native in Illinois, common sneezeweed grows 3-5 feet tall, and will bloom in full to part sun. It's deer- and rabbit-resistant thanks to its bitter-tasting foliage. Since we have rabbit issues here, I was happy to learn this while researching it before choosing the seeds from Monica's swap. Sneezeweed blooms late in the season, making it a great plant for adding color to the garden at a time when blooms can be in short supply. 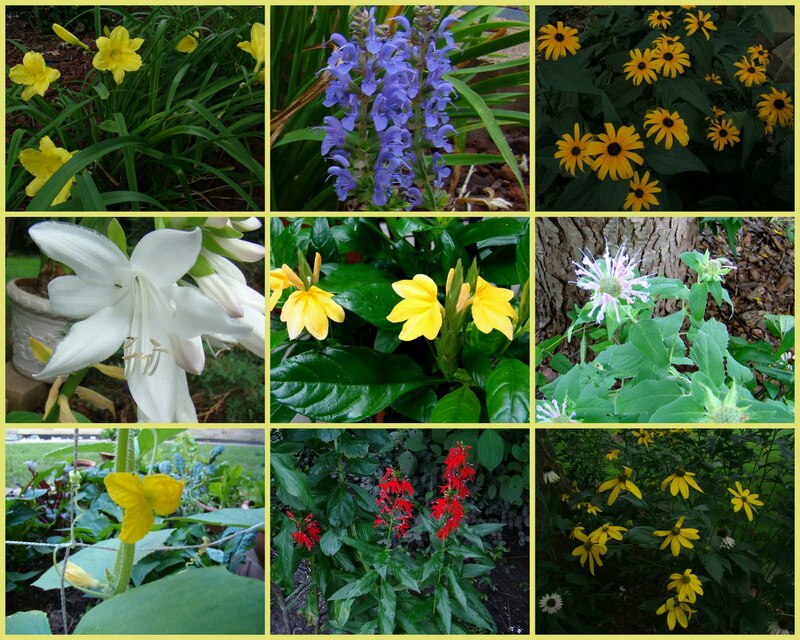 To see more natives plants growing in gardens everywhere, please visit Gail at Clay and Limestone, who hosts Wildflower Wednesday on the 4th Wednesday of each month. Even bigger and better than last year, this week the Independent Garden Center Show at Chicago's Navy Pier was Garden Blogger Central. There was more to see than a person possibly could in one day, at least this person, who enjoyed talking to vendors and running into bloggers everywhere. Most of the day was spent with Kylee and her mom, visiting as many booths as we could fit in. We met in person for the first time at Chicago Spring Fling and enjoyed some memorable moments together. It was a joy seeing them again, and hanging out at the show. When I arrived, Kylee was shooting photos of Jean Ann and Amanda's podcast with P. Allen Smith. If you haven't listened to the podcast yet, you're missing all kinds of hijinks and hilarity. Really, you should listen to it! The social aspect of attending the show was wonderful, and so were many of the products on display. My hands-down favorites were these indoor gardening LED lights. I'm telling you, these things were awesome. While a little pricey, they are beautiful, very energy efficient, and perfect for anyone like me who does a lot of indoor gardening. The holidays will be here before we know it, and one of these units would make a wonderful gift for the gardener in your life. seedlings could be started, even vegetables can be grown indoors over the winter with these fantastic lights. Invented by an entrepreneur with a passion for both technology and sustainability, SonnyLights are energy-efficient, elegant, and technologically more advanced than any other grow lights I've ever come across. It would take an entire post to tell you what's so great about them. Better yet, visit his website where he can tell you all about them himself. Left to right, Nellie (Marketing,) Renee, and me! Tuesday, I had been working in a client's garden. One of my tasks was pruning and deadheading the roses, and Wednesday I walked around at the show with two thorns - one in my right thumb, and one in left index finger. You know how it is with thorns - sometimes it takes them a day or so to make their presence known. (OUCH!) As luck would have it, one of the booths I visited was SeaMar Gloves, importer of Atlas gloves, my favorite gardening gloves in the whole world. John, the sales manager manning the booth, graciously allowed us to pick out a pair of sample gloves. With thorns fresh on my mind and in my fingers, I chose a pair of Juggernaut goatskin gloves. When I got home Wednesday evening, I dug the thorns out of my fingers, and wasted no time putting these excellent gloves to work on Thursday. One day at the IGC Show was definitely not enough to see everything and visit everyone. There were some excellent seminars I'd loved to have attended, but one day wasn't enough for that either. Kylee posted lots of photos from the show on her facebook page, and keep an eye out for Shirley Bovshow's Garden World Report from the show, coming soon to a computer near you. Here's what's blooming in our August garden. Collages may be clicked to enlarge. nodding onion, (Thank you Monica!) celandine poppy, (blooms sporadically all summer if deadheaded,) dragon wing begonia, sambac jasmine, Echinacea 'Ruby Giant,' 'Rozanne' geranium, (blooms early June to frost,) double impatiens with diamond frost euphorbia, Phlox 'David,' noid pink phlox. 'Happy Returns' daylilies and the salvia grow in full sun in our front landscape, and the cucumbers grow in the veggie garden in about 5 hours of sun a day. 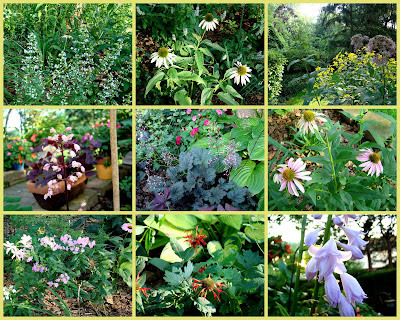 The rest of this stuff, and more, all grows and blooms happily this month in three hours of sun or less per day. I hope this month of dog days finds you, your dear ones, and your gardens thriving. 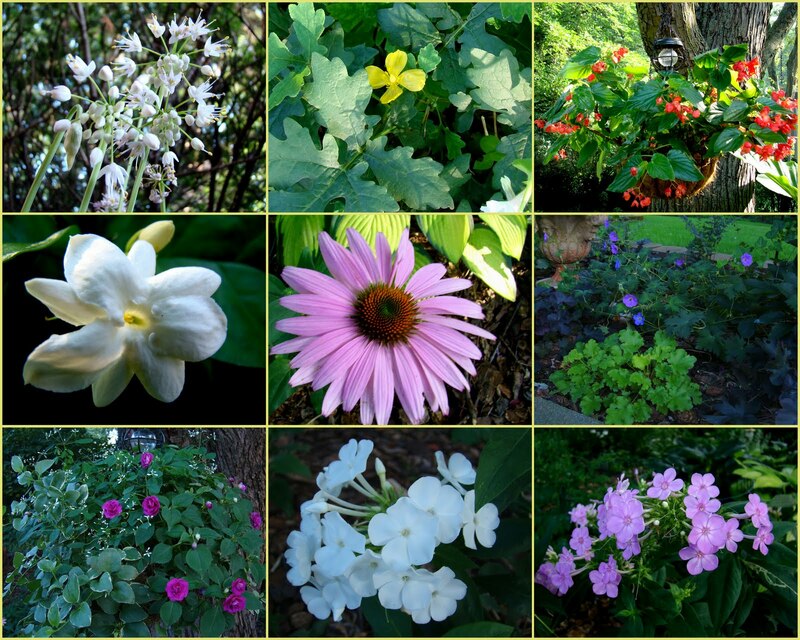 For more Bloom Day posts, please visit Carol at May Dreams Gardens. This season marks seven years since moving here and starting our shade garden. Slow and sometimes frustrating in earlier years, it feels like this season the garden has finally come into its own. While the garden will continue to evolve and tweaking will continue as long as gardening here continues, this season, all season, as I look upon the garden, I feel pleased. In the second year of our west-side, side-yard veggie bed, I was so happy with the harvest from the part-sun bed last year, I added a bed in the east side yard early this spring. Almost identical crops are planted in each bed - an experiment to see what grows best where. Tomatoes are happier on the west side, and peppers on the east. Lettuce, assorted greens, beets, beans, radishes, and herbs seem equally happy in both beds. Peas thrived until early July in the west bed, and cucumbers are now climbing the trellis in their place. Cucumbers have been dissapointing this year, since cutworms attacked the seedlings of the first sowing. The second sowing was done indoors, and the seedlings were allowed to start vining before they were planted out in the garden. They're thriving, and covered with male blossoms. The female, fruiting blossoms should be coming along soon. Cucumbers grow fast, so while I expect a much smaller harvest than last year, I still hope to have lots of cukes in a few short weeks. Every gardening season brings challenges and rewards, and this season has been no exception. With more rewards than challenges this year, in spite of the above-average high heat and humidity, it's not a stretch to say this has been my favorite year yet gardening here in the shade. I was pretty sure the goldfinches were pulling off the coneflower petals, and now I have proof! The video may be a little shaky, but the evidence is rock solid. Dear Mr. Goldfinch, I love your presence in our garden. I even had you in mind when planting all the coneflowers here. I hoped you'd enjoy the seeds. But hey, what's up with pulling off the petals? You don't even eat them. If you please, I'd greatly appreciate it if you'd keep to the seeds, and leave our coneflower petals alone. Of course I realize you'll most likely ignore this request, but I had to get it off my chest anyway. Thank you.